When Jesus said He was not of the world and neither are His people, how can we then live as believers and follow the world’s way through vain traditions of men? The prophet Isaiah addressed this issue long before Jesus spoke the same words in His ministry “Ye hypocrites, well did E-sai’-as (Elijah) prophesy of you, saying, This people draweth nigh unto me with their mouth, and honureth me with their lips; but their heart is far from me. But in vain they do worship me, teaching for doctrines the commandment of men”. (Matthew 15:7-9)…. (Isaiah 29:13). Jesus did not do as the world did but was ever teaching of the truth of His Fathers will. When we do opposite of what the world does it is then we know how Jesus felt and are partakers of His suffering. (1 Peter 4:11-16). When Jesus said “If the world hate you, ye know that it hated me before it hated you”(John 15:18). He has out of love foretold His children the world is perfectly happy following traditions that do not serve the truth of the scriptures. His children stand out and they are hated for the truth they stand for. (John 17:13-17). And now come I to thee; and these things I speak in the world, that they might have my joy fulfilled in themselves. I have given them thy word; and the world hath hated them, because they are not of the world, even as I am not of the world. I pray not that thou shouldest take them out of the world, but that thou shouldest keep them from the evil. They are not of the world, even as I am not of the world. Sanctify them through thy truth: thy word is truth. If one steps back and looks at traditions of men it may open our eyes to see just how ridiculous mans traditions and deceptions are, yet every year many follow without questioning just how did all these traditions get started and is it ordained by God or man? At Christmas the tradition is to believe in things that are NON EXISTANT things such as: 1) Flying reindeer. 2). Angels get wings when a bell rings. 3). Mistletoe is hung in a doorway so people can kiss under it. 4). A snowman named Frosty exists and interacts with children. 5). The singing of a song “I’m dreaming of a white Christmas” is sung but then what do people sing where they get no snow? 6).A fat man in a red suit comes down the chimney to bring gifts to children who are told to put out a plate of cookies and a glass of milk for him. When was the last time you saw a large person coming down a chimney? 7). And when you cut down a pine tree and bring it in the house and decorate it with lights and ornaments – HOW EXACTLY DOES THIS HONOR GOD AND TEACH US OF THE LORD? Ever notice scripture tells us everything that is expected of us YET the word Christmas is not in the entire bible! Traditions of man make void the word of God stands true no matter how much fun all the nonsense seems. Christmas has only been around a couple hundred years or so and with that said IF CHRIST HAS DIED OVER TWO THOUSAND YEARS AGO WHAT HAPPENED TO THE EIGHTEEN HUNDRED YEARS HE WAS NOT HONORED??????????????? When people say how commercialized this time of year is YES! it is for that is what it was made for………. What is black friday and cyber monday for again? To help the merchants go from red to black!! and it’s been working. The only one that is sitting back smiling is the one whose name has been changed from satan to santa……. the one who has come to steal, kill and destroy (John 10:10) and he has been doing a good job now for the last two hundred years. 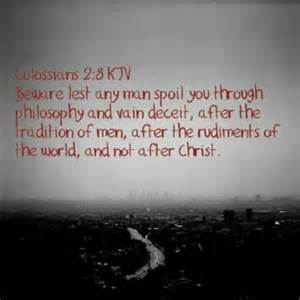 We are told to “Beware lest any man spoil (rob) you through philosophy and vain deceit, after the tradition of men, after the rudiments of the world, and not after Christ. For in Him dwelleth all the fulness of the Godhead bodily”(Colossians 2:8-9).